Just bought a 98 1500 with 116k this year it’s up to 120k now! I guess that’s what happens when it’s the daily driver. I've been a member for quite awhile but haven't posted before. I enjoy everything on the site. I have a 1983 Interstate with 47,000 original kilometres on it, I bought brand new in 1984. I haven't run it since 2005 and I'm in the process of resurrecting it. I noticed the contest for the LED headlight and would like to try one of these on my 83. Being an electrician by trade, I have seen firsthand the strides made in the LED technology and I would like to try it on the wing. Well gosh darn, this is my first time post (or should I say almost first time). No good excuse for not posting much sooner but I guess it's never too late! Keep up the good work on GoldwingDocs, it's GREAT! Goldwing, nothing compares on 2 wheels! Newer to the wing and love it! Wife was not comfortable on my Shadow and we decided to search for a wing last Spring, figuring it would take some time to find the one. 2 weeks after starting search my dealer called and said I needed to come in and see one they were taking in trade, as I had 1st option on it. Took it for a ride and went over it, no question it was the bike for us. So 3 weeks after starting search we were owners of a low mileage well maintained 2012 white wing. Glad to see you post, Luc. Belated welcome to the site. I have been lurking on this site for several months and I have got to say this is the best and most informative forum I have ever seen. Not to mention, the friendliest. All posts are ethical and moral and a sight for sore old eyes tired of the vicious comments allowed on so many forums today. 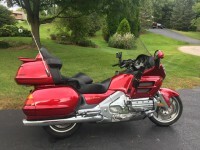 I hope to post more and find the answers to my challenges with my 1999 Goldwing Trike. I've been a member for about a year more or less, and this is my first post. I really enjoy the articles and reviews and have received a lot of information from GoldwingDocs. Planning to be more active in the future. First time post, long time reader. This place is a great location for information and help. It’s been a while since I last posted anything. 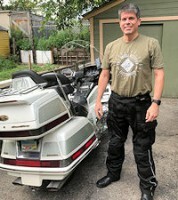 I have been riding my 1988 GL1500 since 1999. I really enjoy riding on roads that are new to me and seeing where they take me. I find a lot of good fun roads to ride on this way. Just another first time poster long time stalker of the site. Love the posts, info, and newsletter. Been riding for about 40 years The last 30 plus on Goldwings. Wife needed room for second child and "Stuff"
I’m one of those who has been reading posts for sometime but this is my first post. I ride a 2013 Gold Wing with a CSC kit. I have been riding Wings since 1991 and am on Wing #4. I just returned from Wing Ding 40 in Knoxville, TN where the attendance was a little over 8,000. My wife and are 2018 Couple of the Year (COY) for GWRRA Region N and were in the selection process for International COY but a couple from Ft Wayne came out on top. We are from the Middle Tennessee area and hope to be more active on this site. Welcome. Coming from a few miles away from where Americade is hosted, I'm curious to hear how Wing Ding compares. It would be fun to make the trip. Some day soon, we hope to relocate to nearer where you are in Tennessee. Wing Ding 41 next year will be at the Gaylord Opryland Hotel in Nashville the end of August. Come on down to Nashville. Only 15 hours. I might be able to make it in two days! Greetings, all! I moved up to a Wing a little over 4 years ago and have not looked back. I have even persuaded (at least) two other riders to acquire an 1800, as well. One of them was a long time HD owner! They both sing praises to Goldwings now. I average between 14-16K miles a year on my Wing and love the reliability as well as the general comfort. That it handles like a sport bike is nice, too. Just returned from a 10 day ride exploring the UP of Michigan and into Wisconsin. Also checked off my bucket list a ferry ride across Lake Michigan on the SS Badger. This site is a great resource despite my Wing requiring little more than minor maintenance. Oil, filters and tires! But anyway, since finding this forum I have enjoyed the tips and tricks shared by so many. Thanks for adding me and I look forward to seeing some of you out there on the road. First post. I have reading the great information on the this site. Priceless. I did post something about a "Gas Cap" a little while ago. Not very good at this. I am rebuilding my dad's 81 goldwing interstate who was the original owner. 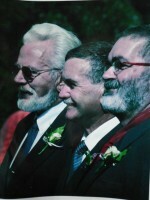 He passed about a year ago. When I am done with the rebuild he will get his last ride on the bike when we spread his ashes. I know he will love it. That is an impressive thing to do for your father. I wish you well in your challenges. Not my first post but just thought I'd check into the correct place since I have been reading tons of info on here for quite some time. I'm Steve from Erie, PA. Have been slowly but surely working to get my grandparents (RIP) wing up and running. Hopefully firing it up before winter for at least a test ride. Then getting it ready for next summer. Welcome! It is good that you are taking the time to get it right, before starting out on the Wing. You will learn more by working on your bike. Do it right, and do it once.